Anna, the Woman Who Blesses Baby Jesus, from "Women of the Bible"
Anna is widowed after only seven years of marriage. A devout woman, she dedicates her life to God, spending as much time as possible in the temple fasting, praying, and worshiping him. Anna is at least eighty-four years old when Mary and Joseph show up to consecrate Jesus. First, she recognizes him as the savior who the people have been expecting for centuries. Then she thanks God she lived long enough to see Jesus and then tells everyone about him. 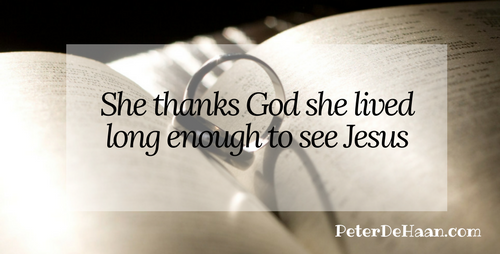 After a lifetime of devotion to God, he rewards her by allowing to to see Jesus. How many other people were likewise as devout, but never got to see him? God calls us to focus on him, but we may not receive any reward for our loyalty during our lifetime. Will we be faithful anyway? Anna inspires me for her faith and dedication to God.